Line microwavable plate with microwavable paper towel. Add bacon; cover with paper towel. Microwave on High 3 to 5 minutes or until crisp. Crumble bacon. Spray 5- to 6-quart slow cooker with cooking spray. Place chicken in cooker. Add carrots, onions, bacon, salt, pepper, thyme, garlic, bay leaves, wine and broth. Skim any fat from surface of chicken mixture. Stir in mushrooms. In small bowl, mix flour and water; stir into chicken mixture. Stir in parsley. Increase heat setting to High. Cover; cook about 30 minutes longer or until mixture is thickened. Remove bay leaves before serving. Sprinkle with remaining chopped parsley. 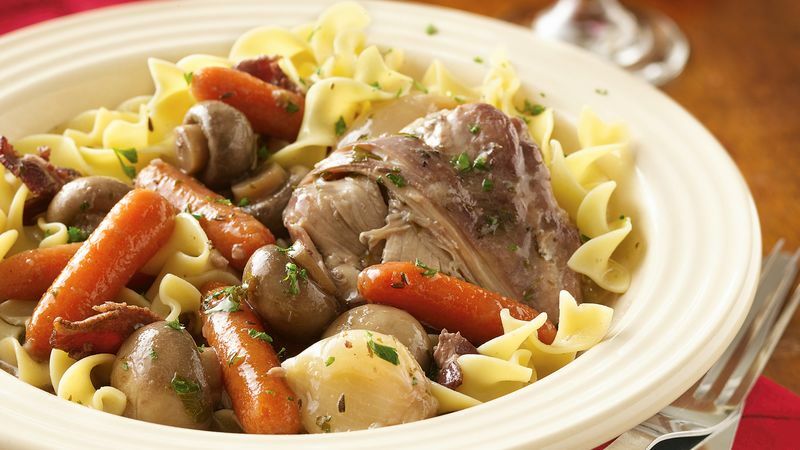 This robust chicken dish, known as Coq au Vin in France, gets its wonderful flavor and rich color from the red wine and bacon. It is usually prepared with bone-in chicken pieces, but we found that boneless chicken thighs work best in the slow cooker. The chicken becomes very tender and will fall apart into pieces for easier serving. If you prefer not to use red wine, you still can make a delicious chicken dish your family will love. Just increase the chicken broth to 2 cups and leave out the wine.